As a fifth grader in Detroit, Benjamin Carson was considered the dumbest kid in the class and was the brunt of many jokes. This didn’t seem to bother him, as all he cared about was playing softball or Tip the Top, and catching his favorite TV shows, The Flintstones and Gilligan’s Island. When his mother saw one of his report cards, he could see that she was upset about his grades. "What’s this grade in reading?" She asked of him. He knew that she knew he didn’t do so well in math, and feeling like the dumbest kid in the class, he didn’t much care about her reaction to his reading grade. "Oh, yeah, but you know, it doesn’t mean much," he said. "No, that’s not true, Bennie. It means a lot. Education is the only way you’re ever going to escape poverty. It’s the only way you’re going to get ahead in life and be successful. Do you understand that?" He did, reluctantly. Mrs. Carson raised both Bennie and his brother, Curtis, herself. Even though she had only a third grade education, she knew the value of what she hadn’t gotten. She could see that her boys were bright, but weren’t living up to their potential. She wanted her sons to have opportunities she never had. She had to devise a plan, and she did. Since she worked long hours, Mrs. Carson often didn’t return home until the boys were in bed. Two days after the report cards arrived home, she left work early to check on her boys. There they were, as she expected, lounging in front of the TV. "Boys, you spend too much time in front of that television. You do not get an education from staring at television all the time….From now on, you will not watch television, except for two pre-selected programs a week." "Just two programs? That’s not–" Bennie said. "And ONLY after you’ve done your homework. Furthermore, you will not play outside after school, either , until you’ve done all you’re homework." "This is what we’re going to do. I’ve asked God for wisdom, and this is the answer I got." Ben tried to offer several other arguments, but Mrs. Carson stood firm. Even Curtis did not try to change his mother’s mind. "And that’s not all," Mrs. Carson said. "In addition to doing your homework, you have to read two books from the library each week. Every single week. And when you’re finished reading them, you must write me a book report just like you do at school." "Yes, Mother." Bennie said. It didn’t occur to him to disobey his mother, but he certainly didn’t like the new arrangement. After school the next day, Bennie and Curtis went to the library. Neither one of them had any idea how to use the library, or even check out a book, but they found the library staff helpful and friendly. Soon, Ben was checking out and reading all sorts of books on his favorite subject, animals. After a month or so, the boys were old pros at finding books to read. After reading all the animal books he could find, he moved on to plants, minerals and rocks. As he read more about rocks, he would go out and look for different kinds of rocks along the railroad tracks in his neighborhood. He had learned how to identify them and became somewhat of a pest about it to his older brother. Ben says that two events occurred in the latter part of fifth grade that convinced him of the importance of reading books. The first was during a spelling bee when the "smartest" kid in the class was unable to spell the word "agriculture." Bennie was listening silently, thinking to himself, "I can spell that word." He had read it just days before. The second event happened in science class. His class was learning about volcanoes. The teacher held up a shiny black rock and asked the class if anyone knew what he had. None of his classmates raised their hands. Ben raised his. "Yes, Benjamin," the teacher said. With the other children laughing around him, Bennie gave his answer, obsidian. "That’s right!" the teacher said, trying not to look startled, but obviously expecting an incorrect answer. Ben went on to give the class all the information he knew about obsidian and volcanoes. "You’re absolutely correct. That is wonderful. Class this is a tremendous piece of information Benjamin has just given us. I’m very proud to hear him say this." For the next few days, Ben felt like a hero at school. The jokes about him stopped and kids started listening to him. He had learned to enjoy reading, but until that time, he hadn’t connected the reading his mother required of him with his schoolwork and the knowledge he had acquired. He started thinking that if he had learned so much about obsidian by reading, why couldn’t he learn about social studies, geography, math or science? During the sixth grade, Benjamin Carson moved to the top of his class. Today he is a world-famous surgeon at Johns Hopkins Hospital in Maryland. Adapted with permission from Everyday Heros, by Beth Johnson. Everyday Heros tells the inspiring stories of 20 men and women who have faced and overcome serious challenges in their lives. 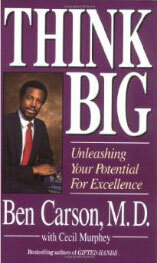 Dr. Carson’s story also appears in his autobiography, Think Big: Unleashing Your Potential for Excellence.